Might have missed one or two spinners. Added from top list. WIll update as the IPL progress. what about perfomance of our pace bowlers ? Impressed by offie deepak chahar. With ashwin he can form two-pronged offspin attack. Ashwin's avg+ER combo is very good, especially ER. He must have been very good in the earlier seasons. 2nd best behind Narine who of course was a shameless chucker for most parts. He used to bowl upfront and bag some of the big wickets. He is one of the most over-exposed Indian spinner. Bowled in Tests, ODIs, T20s, IPL. He is a better LOI bowler than he is given credit for. Very good in both the 50 over WCs (incl KOs), MOM worthy performance in 2013 CT F. In T20s I only follow WT20s and both him and Mishra were on fire in the 2014 edition, especially Ashwin who I thought gave a masterclass performance right throughout the tourney, best ever perhaps (11 wickets, avg/SR: 11/5.35). Another 15 runs and better captaincy by Dhoni would have won us a 2nd WT20 crown. A real pity he is such a sloth bear on the field beset by injuries, apart from fielding/catching I rate him as a better option than even Jadeja who has lost us more matches than won in shorter formats. In fact even in the 2017 CT F, Jaddu was much worse with the ball, not to forget that horrendous run out. Sorry for the digression, long story short despite their initial success and stats Kulcha need to do more to warrant comparison with Ashwin. And I am not sold out on Chahal, I still think as an overall package (mental midget and zero in batting, fielding, catching) he shouldn't partner Kuldeep. Whilst I detest IPL and don't believe it should be taken too seriously, if Ashwin is 100% fit (with tangible weight loss) and fielding decently (Chahal means bar is already low) I would take Ash-Jaddu along with Kully in the squad. Jaddu as specialist 12th man maybe with 2-3 matches in 1st XI thrown in between and Ashwin as a possible (defensive) option as 2nd spinner later in the tournament. 2 wristies is overkill and can backfire because the art is a double edged sword and no way should Chahal play ahead of the chinaman. 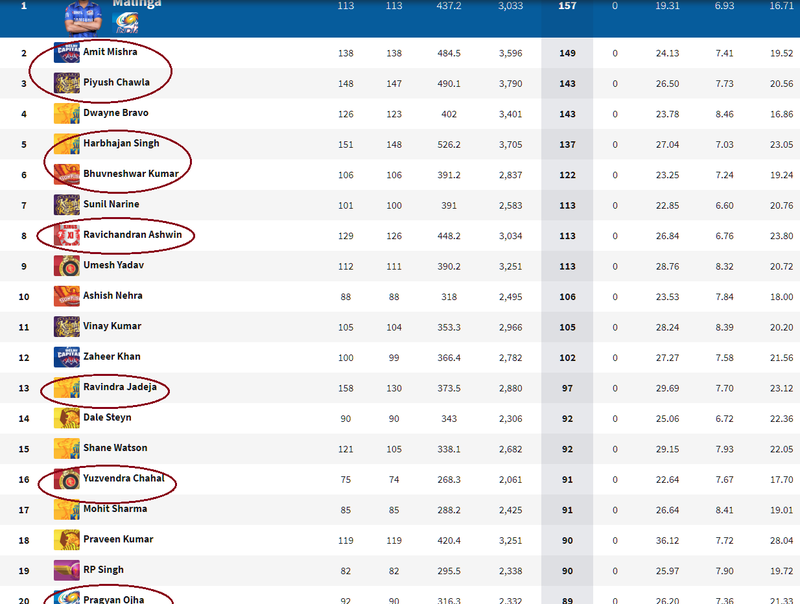 Not just with the ball, at least with Jaddu/Ashwin at number 8 there is some hope of winning a few tight matches if a batsman is batting well at the other end. With our present dud tail, main batsmen are over cautious and even 280/6 in 40 overs can become 285 all out in 43 overs. Just a thought, doubt MSK sees it this way. Chahal easily better than everyone. Extracts more turn per delivery and not afraid to toss up even when hit for sixes. The ball to mayank is the ball of the IPL for me.